In recent years the image of sugar has gone from tasty treat to public health enemy No.1. As always, the truth lies somewhere between these two extremes. What is the right attitude to sugar? 1. WHAT DO WE REALLY MEAN BY SUGAR? The sugar molecule comes in two forms – simple and complex. Simple sugars are glucose and fructose, found in most fruits. Complex sugars such as lactose and maltose are found in milk products and even in beer. The body handles all these sugars in the same way and obtains the same calories from them. The only difference is that complex sugars take longer to digest. Honey, syrup or refined sugar – it is all the same for our bodies. 2. WHAT DOES SUGAR DO FOR US? Sugar found naturally in food is an essential nutrient for humans. The digestion breaks down the complex sugars into simple sugars, and these and the ingested simple sugars move into the bloodstream. From there the sugars provide vital energy for movement, repair and growth. 3. SO WHY SHOULD WE LIMIT IT? It’s the old story – modern lifestyles mean that it is all too easy to take in far more calories than we use. That leads to obesity and all its attendant health risks. Too much sugar has also been linked to the rise in dementia, raised blood pressure and increased risk of heart disease. High-calorie sugar lurks in unexpected places. Many processed foods contain a large amount of sugar. Sugar is added to many foods, even bread. This is especially the case with low-fat versions of foods, which have extra sugar added to improve the taste. This can mean that a low-fat food doesn’t have fewer calories! 4. DOES IT MATTER WHERE THE SUGAR COMES FROM? Yes it does - to an extent. 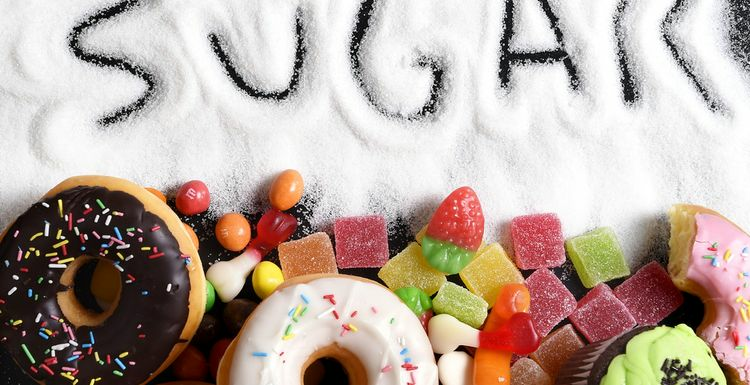 Refined sugar is broken down very quickly by the body, which sends insulin levels soaring. You also don't feel full so are more likely to keep munching down the calories. Sugar found naturally in fruit and milk is metabolised differently as the fibre slows down the metabolism and makes you feel full. Beware however that blood sugar levels are blood sugar levels, regardless of the source of the sugar. If you have a high amount of sugar in your bloodstream, then your body turns sugar into fat or glycogen. It doesn't matter if the sugar came from an apple or a jelly sweet. It ends up the same in the body. This means that we should also beware of the claim that foods contain no refined sugar and instead are sweetened with apple juice whatever other fancy name the manufacturers come up with to make you feel good. It's all treated the same once it goes into your body! 5. HOW MUCH SUGAR IS TOO MUCH? The NHS recommends that no more than 5% of our daily calories should come from sugar. To help to meet this, reduce your intake of processed foods. Cooking from scratch where possible means that you know what has gone into your meal. Of course keeping the cakes and biscuits under control is also a necessary part of sugar reduction. It is unrealistic to cut out sugar totally, but make sure it is kept under control and burn it off with a trip to the gym! Wow - Callum, that's amazing. I find it impossible to ditch sugar. But then I love baking, though I do try and do healthy alternatives. I've completely ditched sugar. It can be done. Even half an apple is too much sugar... I eat no fruit at all anymore. Feel amazing for it!